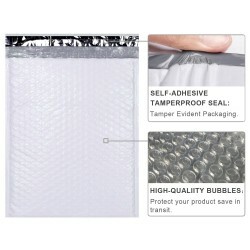 Bubble layered courier bags with the protection of permanent peel and seal closure on the outside and a bubble lining on the inside. A clear overlapping body pocket for the insertion of Airway bill or Consignment Notes etc. is available on the either side of the courier bags. They are widely used..